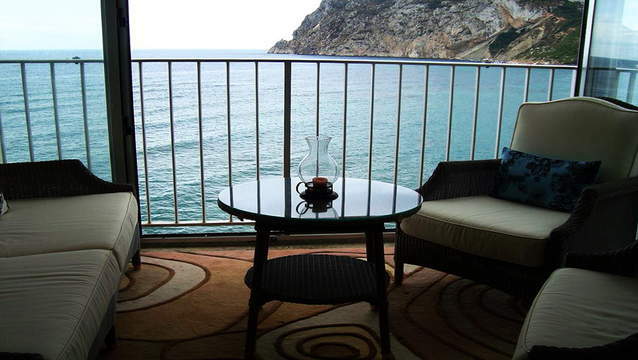 This apartment is located on the Beach of the La Fossa, in Calpe. Specifically on the 5th floor of the Building IFACH III, with the main facade south facing. 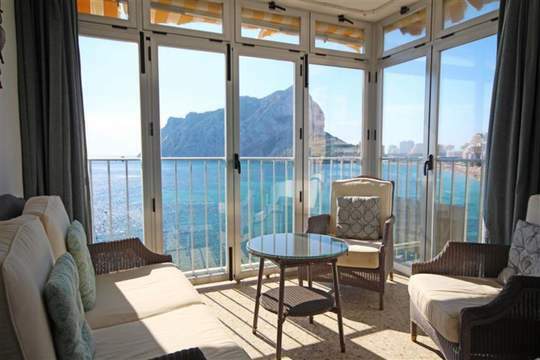 It has a total constructed area of about 85m2, with two bedrooms, both with fitted wardrobes, bathroom, independent kitchen with gallery, large living room with the best views of all of Calpe, Fosa beach, sea and the Rock of Ifach. First line, there is no other building with this orientation, the light, the spectacular views, be able to listen to the waves of the sea, and breathe its breeze... It is the best that there is in Calpe, every sunrise, every sunset is unique thanks to its privileged location, to fully enjoy. All rooms face the exterior; you can see the sea from the living room, the dining room, the kitchen, the gallery and the master bedroom. Thanks to its excellent orientation, the apartment in summer is very fresh, always runs the sea breeze, and in winter very warm since it gives from the first to the last ray of sun, is unique, I can assure you. Just in front of the building is the sea and a few rocks, and then there is the sandy beach "La Fossa", considered one of the best beaches in the entire Mediterranean Sea. This small distance from the beach (about 100 meters), is enough to not hear the murmur of the people on the beach, the noise of the bars, or the machines that clean the sand. It is in a quiet area, if you open the windows or the doors of the terrace, you can only hear the waves of the sea as they break on the shore, and you can breathe a clean and fresh air characteristic of the sea. A real pleasure for all the senses. 100 meters there is a bus stop to go to the village, and at 200 meters are located large supermarkets such as Comsum, Mercadona or Aldi. The apartment is reformed, electrical installation and all the carpentry is new, with armored security door, the windows are aluminum with airtight, swinging and climalit. In the price It is included a Parking space, the parking place and its easy access to the foot of the building makes it very comfortable, also its direct access to the promenade that goes to the beach. The community fee is only 60 per month, and includes all water consumption. The building enjoys excellent maintenance of common areas, cleaning, elevators, etc. This year IBI has paid 319 , and garbage 54 a year (annual payment). The Furniture is NOT included in the price, beautiful and top quality, valued at more than 6,000 , we can negotiate.